A growing number of artists are finding inspiration in the wonders of horology. 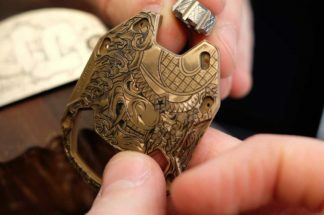 Using a variety of different styles, from graphite sketches to bold watercolors, CAD drawings and floating sculptures, a new version of watchmaking art is emerging, much to the delight of watch collectors everywhere. In part one of a two-part series, Revolution’s Sophie Furley talks to artists from all over the world to discover more about how they developed a passion for watchmaking. The #Rolex #Submariner #116610LN ♛ available soon! Brend’s clients are mainly watch collectors and watch boutiques and his most popular print by far is the Rolex GMT. 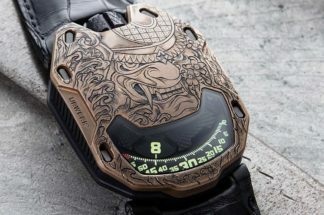 He has produced drawings of Rolex, Patek Philippe, Audemars Piguet, Cartier, TAG Heuer, Breitling and Richard Mille and the list keeps growing. An autodidact artist based in Copenhagen, Cay Brøndum creates a unique form of watch-inspired art that he calls historic horological art. Like many artists it was chance that brought him into the world of watchmaking. Painting mainly with watercolors, ink and acrylic, Brøndum’s style isn’t detailed. He prefers the more lifestyle interpretation of a watch with different textures. The watch is precise, but there are splashes of paint and brush strokes that add something unique to each artwork. He once found a bunch of old papers from the 1930s, ‘40s and ‘50s and decided to use them as a backdrop for his work, but now he is working on larger canvases as he is running out of old papers! Brøndum creates a wide range of artwork from limited edition prints on aluminum (starting from €379) to large limited-edition artworks on canvas. He has stopped doing commissions due to a lack of time, but is happy to add a detail or two on request! Carnaille’s father was a watch collector so he had been exposed to watchmaking from a young age and it was towards watchmaking that he turned when creating some of his first sculptures, using components from old watch movements. The main challenge when working with magnets in this way is that they have north and south poles, drawing the metal components to the ends and leaving the middle bare. In order to cover the entire magnet with watch parts Carnaille attaches hundreds of tiny powerful magnets around the middle of the main magnet. Each of these tiny magnets has to be coated in resin so it won’t stick to the other magnets, which demands extreme patience. Each of Carnaille’s creations takes about a month to create and they range in price from €9,000 to €60,000. They are available at the M.A.D Gallery in Geneva, Dubai and Taipei. He also has an upcoming exhibition at Pisa Orologeria in Milan from September 4th to 19th. His interest in watches has been with him from a young age and when he started painting again he decided to paint a Rolex GMT 1675. It wasn’t a watch that he owned, but one that he really wanted! He paints on canvas with acrylic and likes to use different inks among other materials: “My style is aggressive and heavily gestured; some people say it is almost street style.” He loves to paint watch faces and frequently does commissions for watch collectors. The originals come in a large format (30 x 40 inches) and cost $19,480. Artist proof canvas prints that are hand-signed and limited to 150 are $4,950, and limited prints on museum etched paper (limited to 250 prints) are $680.